Probably the most popular way that biologists have for classifying all living organisms on Earth is the three-domain system. It has three separate domains: bacteria, archaea, and eukaryota. Members each domain are either single cells or multicellular organisms. Members of eukaryota are either single cells or multicellular, but in all cases the cells have a complex structure, with a nucleus and a variety of membrane-enclosed organelles. Although bacteria and archaea are superficially similar to each other, with very little internal structure, their differing molecular biology justifies putting them in separate domains. Not long ago structures were found in some bacteria that closely resemble organelles (acidocalcisomes) that store phosphates and related chemicals in eukaryotes. Now very similar structures have been found in some archaea. 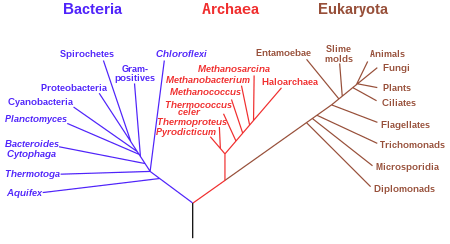 The presence of versions of the same basic structure in all three domains suggest that the common ancestor of the three also had some degree of complexity, instead of the simplicity that had been supposed. Scientists call it LUCA, the Last Universal Common Ancestor, but they don’t know much about this great-grandparent of all living things. Many believe LUCA was little more than a crude assemblage of molecular parts, a chemical soup out of which evolution gradually constructed more complex forms. Some scientists still debate whether it was even a cell. 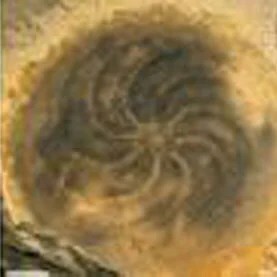 New evidence suggests that LUCA was a sophisticated organism after all, with a complex structure recognizable as a cell, researchers report. Their study appears in the journal Biology Direct. The study builds on several years of research into a once-overlooked feature of microbial cells, a region with a high concentration of polyphosphate, a type of energy currency in cells. Researchers report that this polyphosphate storage site actually represents the first known universal organelle, a structure once thought to be absent from bacteria and their distantly related microbial cousins, the archaea. This organelle, the evidence indicates, is present in the three domains of life: bacteria, archaea and eukaryotes (plants, animals, fungi, algae and everything else). So, what is it, exactly, that the researchers have found? When did the first animals appear, and what (if any) descendants did they leave? The best evidence suggests that “when” was roughly 600 million years ago, during the Ediacaran period. “What” is a harder question. There’s a rivalry going on among the earliest ancestors of sponges, cnidaria (jellyfish and sea anemones), and comb jellies (like jellyfish, only different). A 580-million-year-old fossil is casting doubt on the established tree of animal life. The invertebrate, named Eoandromeda octobrachiata because its body plan resembles the spiral galaxy Andromeda, suggests that the earliest branches in the tree need to be reordered, say the authors of study in Evolution and Development. The researchers, led by paleontologist Feng Tang of the Chinese Academy of Geological Sciences in Beijing, believe that Eoandromeda is the ancient ancestor of modern ocean dwellers known as comb jellies — gelatinous creatures similar to jellyfish, but rounder and with eight rows of iridescent paddles along their sides. If they are right, it would be the oldest known fossil of a comb jelly.